This heavy duty bar tacking machine purchased by a fall arrest safety harnesses manufacturer in Gwyunedd, UK. 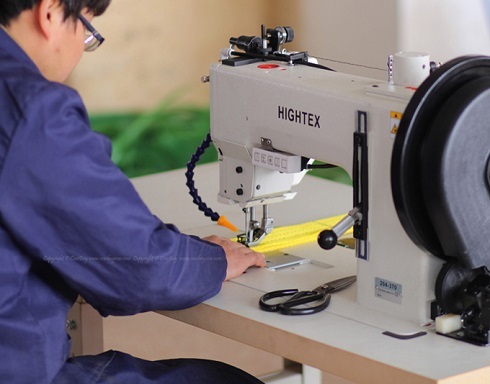 This machine can make a revolution in your sewing production of cargo lashing straps, safety harness and seat belts: High production efficiency due to its high speed provides high efficiency (1600 rpm); Large rotary hook with 3 times bobbin capacity; Easily sew with thick thread up to metric size #10 (=T-270, V277, 840dx3). 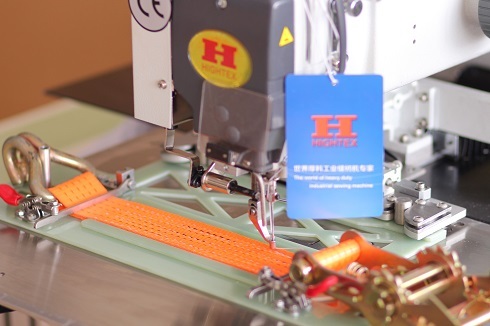 This high speed ratchet straps sewing machine purchased by HIGHTEX authorized dealer in Colchester, Essex. 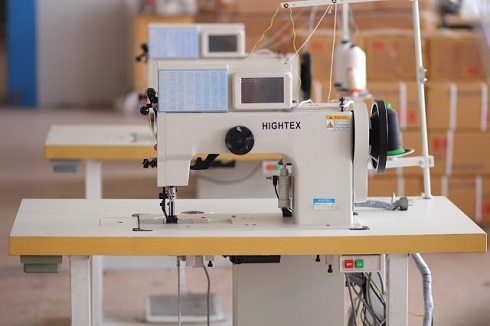 Heavy duty, thick thread, programmable pattern sewing machine can sew with extremely thick thread up to V415, V462 and 1500Dx3 high tenacity polyester yarn, ideal for manufacturing ratchet tie down, cargo lashing straps, spanet and lashing belts. 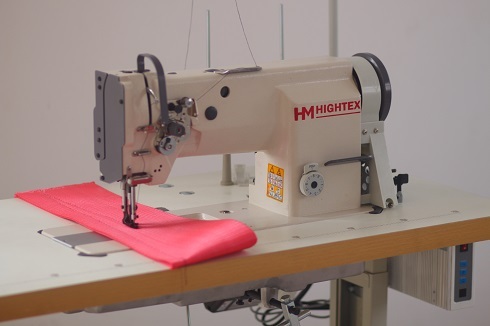 This high efficiency cargo straps sewing machine purchased by HIGHTEX authorized dealer in Colchester, Essex. This leather decorative stitch sewing machine is purchased by HIGHTEX authorized dealer in Colchester, Essex. 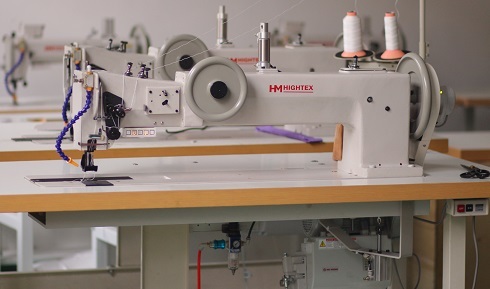 This lifting sling and harness sewing machine purchased by HIGHTEX authorized dealer in Colchester, Essex. Two needle extra heavy duty long arm compound feed industrial sewing machine with puller feed (optional). The long and wide working space is suitable for sizable materials such as tents, tarpaulins,truck covers,parachute, sails and canvas sheeting etc. By removing one needle and bobbin, the machine will perform excellently as a single needle machine. This gives the parachute rigger and tents manufacturer two machines for the price and space of one. This heavy duty long arm sewing machine purchased by HIGHTEX authorized dealer in Colchester, Essex. 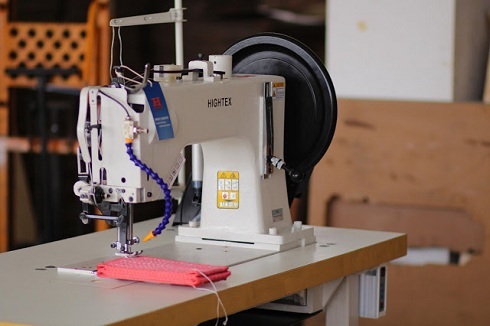 This slings sewing machine purchased by HIGHTEX authorized dealer in Colchester, Essex. 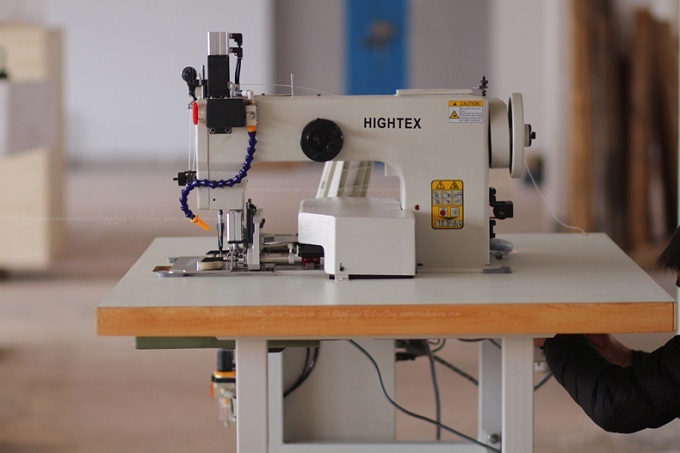 This heavy duty industrial sewing machine is especially dedicated for sewing operations on heavy duty, such as webbing slings, car seats, bags, tents, etc.. 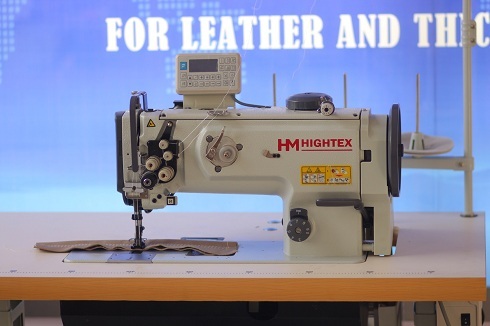 This heavy duty leather and webbing sewing machine is purchased by HIGHTEX authorized dealer in Colchester, Essex. The unique feed mechanism promises excellent efficiency of feed. 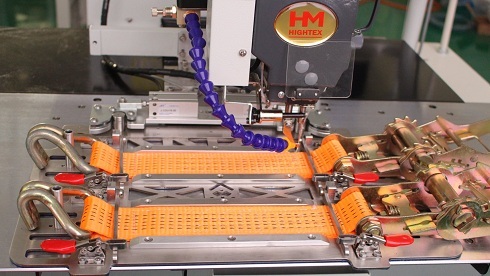 In addition to the standard models of 1-needle and 2-needle machines, other models intended for special purposes are available, including models for extra heavy materials and one (7560N-7) having a thread trimmer. The machine is applicable to an extended range of heavy materials for industrial use, such as cargo lifting & lashing belts and containers, as well as those for general use, such as car seats, sofas and bags, thereby contributing to both improved quality and increased productivity. This leather and upholstery sewing machine is purchased by HIGHTEX authorized dealer in Colchester, Essex.